eLEND joins Heroes Mortgage Program to offer down payment assistance for heroes SEE PAGE 18 FOR DETAILS. Campbell Supply Co. Command Fire App. Dwelling Fire in Upper Hanover Twp. Upper Hanover Twp., PA - On Sunday, February 17th at 3:00 P.M., East Greenville Fire Co., along with several other fire companies from the area, were called to a dwelling fire on Wasser Road. When Deputy Chief Mike Wetzel arrived he had smoke showing from the kitchen area. He called Chief Jason Wilson who then called Montgomery County Radio to upgrade the call. With the additional manpower and equipment, the fire was brought under control within 15 minutes. Various handlines were utilized to bring it under control. Several windows in the rear of the dwelling were knocked out to help ventilate the condition. The cause of the fire and the damage is pending the outcome of the investigation. There were no injuries. The occupants of the dwelling were outside when firemen arrived. Assisting East Greenville were Pennsburg, Hereford, Milford, Trumbauersville and Lower Milford fire companies. Hereford, East Greenville and Pennsburg fire police, along with Upper Perk and Harleysville EMS, and PA State Police Fire Marshal also responded. 1st Responder News (ISSN 1525-1683) - Pennsylvania edition - Vol. 23 No. 3 - is published monthly, 12 times a year for $36 per year by Belsito Communications, Inc., 1 Ardmore Street, NY 12553. Periodicals Postage Paid at Newburgh, NY and additional mailing offices. Postmaster: Send address changes to 1st Responder News, 1 Ardmore Street, NY 12553. No financial responsibility is assumed by this newspaper to publish a display, classified, or legal ad or for typographical errors except of reprinting that part of the ad which was omitted or A division of: in error. Omissions or errors must be brought to the attention of the newspaper during the same month of publication. Printed in Canada. Notice: The advertisements, articles, and letters contained in this publication do not necessarily reflect the views of 1st Responder Inc. and Belsito Communications, Inc. Advertisements are sold pursuant to the "space available" and corresponding fee schedule. The mere fact that advertisements are contained in this publication does not express nor imply that 1st Responder Inc. and Belsito Communications, Inc. vouches for the credibility of the claims made in the advertisements or the representations expressed or implied in them. Two Bodies Found at House Fire in Palmer Twp. Palmer Twp., PA - On January 4th, Palmer Township Fire Department (Northampton County), worked a residential house fire where two victims were located in the garage of the home. The incident is being investigated by Palmer Township Police and Fire as a suspicious fire and death investigation. JUMP TO FILE #022119101 collapse zone was established as apparatus were repositioned. An additional ALS truck was requested on top of the four already on scene. As flames started to show from the building, crews went to work protecting the exposure buildings. As the incident reached one hour in, command requested Field Comm 1 to the scene along with Canteen units to feed approximately 100 to 150 personnel. Special Service 313 was requested to be used as a warming unit due to the cold weather. The operation went completely defensive as apparatus were being repositioned and tower ladders were being placed around the building. A couple minutes later, the thirdalarm was transmitted and staging was set in front of Station 53. Multiple trucks were already en route as cover companies and those companies became the third-alarm. As figuring out a water supply for all the tower ladders became more difficult, water supply operations were switched to Event 5. By the one hour and 20 minute mark, command reported that there was fire throughout the two-story, 40-ft. by 150-ft. building. Fire Police from multiple companies were dispatched to assist with traffic control. As cover companies were being dispatched to surrounding stations, the Western LDH task force was requested to assist with water supply. Due to the amount of units on the scene and and those sent to cover from the western part of the county, the Eastern Large Diameter Hose Strike Team was dispatched instead. Deputy 27 was designated as the water supply officer and an engine was requested to lay in from Elizabeth Drive, over three quarters of a mile from the scene, up E. Mt. Kirk Ave. The nearly 5,000-foot lay was completed by multiple engines to the rear of Station 53 and across the street into Engine 53. As the LDH was still being deployed, the roof of the building started to cave in on the 'Bravo' side. Just after 11:40 P.M., Tanker Task Forces from Bucks and Chester Counties were dispatched, bringing tankers as far as Lionville and Upper Makefield Township in to assist with water supply as pressure from the hydrants began to drop. An additional four tankers from Montgomery County were dispatched as well as two from Berks County. At noon, the decision was made to shut down all master streams and reassess the scene. Two fill sites were established, one at the Collegeville shopping center and one at a church in Skippack Township. For more than four hours, tankers travelled the 6-mile round trip dumping water at the scene and filling up in Collegeville or Skippack. Tankers dropped six porta-tanks at the scene to allow five tankers to constantly dump water. All tanker operations were switched to Event 8. Fire above the entrance in which crews made initial access into the building. Fire blows out of the 'Alpha' side of the building as crews reposition. Lower Providence Quint 53 and King of Prussia Tower 47 flowing water into the building. Adam Alberti • Jim Alercia • Stephen Barrett • Jason Batz • Denny Clopper • Timothy Coover • Scott Derr • Bob Devonshire • Dale Feerher • Patrick Griffin • Dylan Hoover • Roman Isaryk • Ron Jeffers • Doug Kahn • William King • Nik Knauer • JC Kriesher • Seth Lasko • Joseph Lennon • Brett Mack • John Malecky • Anthony Miccicke • Kirk Neidermyer • Artie Osniak • Eric Rasmussen • Lucas Richardson • Terry Ritz • Frank Robinson • Shane Shifflett • Jesse Shutt • Darin Smith • Ken Snyder • Raymond Stender • Mark Walsh • Eugene Weber Jr • Barbara West • Dennis Wetherhold Jr.
Join our team of correspondents or columnists! 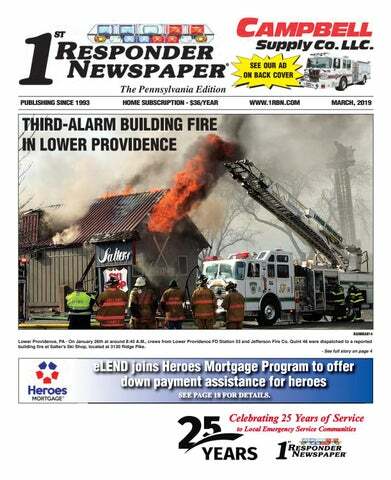 1st Responder Newspaper welcomes submissions by our readers. Send stories and photos to us at news@1strespondernews.com. Or, give us a call or post it directly to www.1rbn.co. Publisher reserves the right to refuse any editorial or advertising material submitted. 1st Responder News’ graphics team will work with you on your adverA division of: tisement free of charge. Additionally, we offer a complete marketing department for all of your printed needs. Whether they are posters, or single sheet handouts, full color or black and white, no one else delivers the high quality work at our competitive prices. 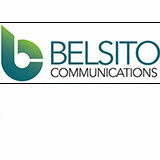 As a newspaper in the Belsito Communications Inc. family, 1st Responder News has a state-of-the-art production facility which utilizes the latest scanning technology available. Materials are processed using Power Macintosh G4s. Output is handled on our HP Color LaserJet 8500 to produce the highest quality black and white or color prints on the market. Reading, PA - Early on the morning of Monday, February 4th, the Berks County Department of Emergency Services received a phone call reporting a bad car accident in front of 436 Lancaster Avenue. As dispatchers began processing the information, additional calls began to come in providing similar details. Engine 5 arrived moments later with a heavily damaged sedan and debris all over the roadway. Firefighters checked the driver, who was found deceased. Crews secured the area and awaited the arrival of representatives from the Berks County Coroner's Office. Once the initial investigation was completed, the occupant was extricated using hydraulic rescue equipment. Units cleared the scene two hours later. Makers of FIRELITE and MEDLITE transport skid units celebrate 35-year heritage in design, manufacture, and sales of public safety equipment worldwide January 10, 2019--Orleans, VT KIMTEK Corp, makers of MEDLITE® and FIRELITE® Transport skid units for off-road rescue and wildland firefighting, have announced plans to celebrate the company's 35th anniversary with a number of events planned throughout 2019. KIMTEK Transport skid units fit easily into most utility vehicles and pick-up trucks, enabling first responders to travel over rough terrain and through tight clearances with essential fire and/or medical rescue equipment and attendants. Markets have responded enthusiastically, resulting in record demand for KIMTEK products around the globe. Reaching this corporate milestone represents a personal achievement for KIMTEK president and founder Kimball Johnson, a multiple patentholder and retired fire chief who understands firsthand the challenges of meeting off-road rescue needs while under strict budget constraints typical for municipal and government agency emergency departments. Transport skid units are now in service in all 50 United States, all of Canada, all branches of the military, the National Park Service, numerous NASCAR tracks, sporting complexes, schools, universities, industrial and commercial facilities throughout the country, and other vital applications worldwide. KIMTEK's Transport units are designed to work interchangeably with existing and new equipment, optimizing municipal budget dollars and enabling easy, affordable upgrades. Since the company's inception, KIMTEK's mission has been to offer affordable, practical solutions for the agencies they serve, resulting in highly popular emergency response products that emphasize modularity and flexibility and which offer the best in-class warranty coverages. More information about KIMTEK research and products is available at the company website: www.kimtekresearch.com and www.brushtruckskids.com, or by calling 888-546-8358. Allentown E-13 in service at a 4-alarm warehouse fire on October 7th. Pittsburgh, PA - At 2:05 A.M. on February 6th, City of Pittsburgh fire units were dispatched to the 2100 block of East Carson Street in the city’s South Side section for a fire alarm at the Carson Towers. As units were being dispatched, multiple calls began coming in for a reported fire inside the building. A full structure assignment was added to the alarm. Crews arrived to find a working fire in a basement apartment. As crews made entry and began to attack the fire, command requested a hi-rise assignment to be added which automatically moves the incident up to a three-alarm fire. Rollover Involving Log Truck in East Lampeter Twp. East Lampeter Twp., PA - East Lampeter Township firefighters responded to a motor vehicle accident involving a rolled over tractor-trailer that was carrying logs on the eastbound ramp to Greenfield Road on January 11th. Lafayette, Witmer and Bird n Hand Fire Companies responded. There were no reported injuries. Firefighters arrive at the Wild Rose Horse & Cattle Company to find heavy fire conditions. Barn Burns to the Ground at Wild Rose Horse & Cattle Company "My name is Jorge Diaz with the Boston Fire Department. I am on Engine 28. My thin red line tattoo displays a half soldier/half firefighter, representing my service to the military and my current service to the City of Boston as a firefighter." To protect emergency scenes, the Linglestown Fire Co. of Dauphin County has placed into service this 2017 Chevrolet/Reading as Traffic 35. Fairfield Community Fire & EMS has placed this 2018 Pierce Enforcer-PUC (1500/1000) into service as Rescue-Engine 2. Twin Valley FD Station 69 recently took delivery of this 2018 Pierce Arrow XT Heavy Duty Rescue, designated as Rescue 69. North Bangor has placed into service this 2018 Pierce PUC 1500/750/25 as Engine 3911. Schuylkill County, PA - At 9:31 P.M. on February 3rd, Schuylkill County 911 dispatched a first-alarm assignment to 22 Pike Street in Port Carbon for a reported house fire with pos- JUMP TO FILE# sible entrapment. 020419100 Fire Districts 59 (Port Carbon), 57 (Palo Alto), 68 Stations 20, 30 & 60 (Pottsville– Phoenix, Humane and Yorkville), and 62 (Saint Clair–Alert) were dispatched. Marshal 59 was immediately on the air reporting smoke showing, followed by Chief 59 who called on scene with a working fire. The chief immediately struck a second-alarm, which brought Pottsville Engine 68-11, Ladder 68-25, Saint Clair Engine 62-12 and Schuylkill Haven Squad 6369 (Liberty) to the scene. Chief 59 reported that all occupants were out of the building. Firefighters found fire showing from the first-floor of a middle of the row three-story residence on the 'A' side. Engine 59-11 was directed to take the address and “gun it” with the deck gun. Chief 57 went to the rear and found the house heavily consumed in fire and spreading to the attached exposures. Engine 68-12 was directed to the back with Chief 57 and Ladder 68-21. LDH was handjacked from 59-11 to a nearby hydrant as the deck gun began to hit the fire. Crews began to stretch multiple lines from both the 'A' and 'C' sides into the structure. Firefighters made little progress on the fire, as it would quickly flare back up after being knocked down. Engine 57-12 positioned behind 59-11 while Tower 62-21 snuck by them and set up for operation in front of the building. Ladder 68-25 came in from the east side and set up to the 'D' exposure. Engine 68-11 secured a hydrant, laid into the rear and supplied Engine 68-12. Chief 57 reported that conditions were not improving in the rear either. A third-alarm was struck, bringing Pottsville Engine 68-14, New Philadelphia Engine 54-11, Cumbola Engine 2-16 and Schuylkill Haven Tower 63-25 to the scene. Engines 54-11 and 6814 were directed to tag a hydrant at 5th and Market Streets and lay around 2,500-feet of LDH into the scene. Rapid Intervention Teams were brought in from Schuylkill Haven and Englewood. Engines from Minersville were also special called into the scene. Firefighters continued to try an interior firefight, but conditions continued to worsen and all crews were pulled out of the building. Deck guns were opened up and multiple hand lines were put in place from the street as well as the master stream from Tower 62-21. Firefighters climb down Pottsville Ladder 68-25 after all crews were evacuated from the interior and roof of three rowhomes that were consumed by fire on Pike St. in Port Carbon on 2/3/19. Shamokin Twp., PA - Elysburg Squad 175 was alerted firstdue on January 24th to a working structure fire as they were returning from an MVA. The squad arrived and assumed first arriving duties. Crews stretched a line and were met with heavy fire in three rooms, and extinguished the same. Simultaneously, others from the crew worked to ladder the building and create a rural water supply. Units on the first-alarm included Stations 170 (Elysburg), 6-3 (Stonington), and 290 (Ralpho Township). Chief 6-3-1 had the command. This patch belongs to the Lampeter Fire Company, located in Lancaster County, PA.
Wilkins Township Station 304 Fire Chief, Mary Beth Bowler, takes command at a recent fire in her fire district. Trying to contain 2,000-gallons of spilled motor oil. Kariba Farms, one of the preeminent specialty food companies in the country, is launching a new Healthy Heroes Snack Pack monthly subscription for police, fire, rescue and EMS departments to help their members make healthy choices when they are reaching for a snack at the station. Kariba Farms will send a Healthy Heroes Snack Pack to fit the size of your department so there is enough to keep your members healthy and happy for the whole month before the next month’s shipment arrives. All subscription prices include free shipping. vegetables, etc. to include. A report by the Harvard School of Public Health found that people who ate nuts every day lived longer, healthier lives than people who didn’t eat nuts. Additionally, eating nuts lowers LDL (‘bad’ cholesterol), raises HDL (‘good’ cholesterol) and also lowers blood pressure and blood pressure responses to stress. Every flavor is all natural with no preservatives and is made with Flax* for heart-healthy ALA Omega 3's. * If you are allergic to flax, please let us know when you place your order and we will make a special batch for you without flax. Beaver Meadows Vol. Fire Company Engine 21-11 operates as the first-due engine for a fire in Banks Township. Engine 21-11 is a 2003 KME Pumper that formerly served as Hazle Township Engine 102. Crews were forced to battle from the exterior due to conditions. Van Versus Plow Truck in Shamokin Twp. Elysburg, PA - At 6:45 P.M. on January 29th, Elysburg Squad 175 was alerted to an MVA with entrapment at SR 61 and Tulip Road. Chief 170 arrived shortly after and advised the squad of a two-vehicle accident involving a passenger van and plow truck, with the driver of the van entrapped. The squad arrived a short time later and crews split up to provide patient care, vehicle stabilization, extrication and hazard control. In less than 15 minutes from dispatch, crews removed the driver’s door and 'B' post, and removed the victim. The area received approximately three-inches of snow earlier that day. Stations 6-3 (Stonington) and 290 (Ralpho Township) assisted the squad. Two of the dogs rescued being cared for by McCandless Police Officers. down payment dollars needed at closing. The grant is “forgivable” so it doesn’t have to be paid back, and there are no resale or borrower repayment restrictions. In the state of Wisconsin, appraisal cost (up to $700) is credited back at closing. This program is not yet available in Hawaii or Washington. To qualify, a borrower need only meet one of the following very flexible requirements: a current, retired, volunteer or professional first responder (police officer, firefighter, paramedic, emergency medical technician, etc. ), educator, medical personnel, civil servant or military personnel, or a first-time homebuyer or meet certain income requirements. “We’re excited to introduce our Advantage Program to the Heroes Mortgage platform,” said Bill Packer, executive vice president of eLEND, a division of American Financial Resources, Inc. “It’s our way of trying to help hometown heroes advance their dreams of home ownership.” For more information or to check your eligibility for The Advantage Program, visit www.heroesmortgage.com/AdvantageProgram or call 877-541-HERO. For more information or to check your eligibility for The Advantage Program, visit www.heroesmortgage.com/AdvantageProgram or call 877-541-HERO. WHERE ARE THEY NOW? If you have photos you would like to see in our Where are they Now? feature please upload them on our website www.1stResponderNews.com or email them to Lindsey@1stResponderNews.com. Smoke escapes from the front of the department store. Hazleton’s Boscov Department Store Damaged by Fire Luzerne County, PA – Around 4:20 A.M. on Thursday, January 31st, Hazle Township Fire Rescue was dispatched to the Boscov’s Department Store in the Laurel Mall for a commercial fire alarm. Crews were advised of a sprinkler activation. 141 Engine 3 arrived on scene and found smoke showing from one of the main entrances. The engine requested the box to be upgraded to a commercial fire. 141 Tower 7 arrived on scene and positioned in front of the engine. Crews stretched a leader line through the front door after taking out the glass. Smoke was filling the entire second-floor of the department store at this time. The Port Trevorton Fire Co. is now running this 1996 Seagrave rescue/engine as Squad 60. This piece previously served the Fairfield Fire Co., located in Adams County, PA. This 1949 Ward LaFrance 750/250 was once used by Newport Twp. and is now privately owned. Order 10 or more G-series pagers and get a free 5 year warranty. Valid through 3/31. Ten of the 18 overall Firefighter 1 or Firefighter 2 Westfall FD certified members were on hand January 5th for a ceremony held to honor WFD’s recognition at the 50% level of active membership certification. (L to R): Capt. Fred Jacobs, Mike Fischetta, Capt. John Codichini, Matthew Kidd, Kaylee Small, Lt. Hayden Thompson, Issac decker, Rich Thomas, 2nd Assist. Chief Bernie Swartwood, and President Bill Koferl. Fischetta, Sean Heater, Kyle Innella, Fred Jacobs, Bill Koferl, John Llewellyn, Bernie Swartwood, Rich Thomas, Hayden Thompson, Andrew Van Ecklenberg and Erik Wells. Officers for 2019 are Chief Fred Jacobs, 1st Assistant Chief Mike Pflanz, 2nd Assistant Chief Bernie Swartwood, Captain John Codichini, Lieutenant Hayden Thompson, President William Koferl, Vice President Patrick Cordova, Secretary Cathy Southard, Treasurer Chelsea Adams, and Financial Secretary Sarah Pflanz. Daughter/mother team Sarah Aschoff and Rachel Rosker Aschoff represent one of the multi-generational families to actively serve in various compacities with Westfall FD over the years, including as firefighters and EMS responders. Engine 1 was first-due and stretched a line for fire on the first-floor. JUMP TO FILE #011219109 to respond after crews found the victim. As crews from multiple companies worked together to remove the victim from the second-floor front bedroom of the house using a ground ladder, EMS requested a fourth medic truck due to the condition of the unconscious victim. As the victim was removed and handed into the care of EMS, crews knocked down hot spots on the first-floor and started checking for extension. Approximately 30 minutes after the initial dispatch, command placed the fire under control with overhaul. Birdsboro-Union FD Engine 7 cleared the scene and covered the area as crews worked the fire. FM 23 and a Pennsylvania state police fire marshal stated that the cause of the fire was likely due to an electrical issue. The victim that was rescued was recovering after inhaling smoke, along with the male that received burns and some smoke inhalation. Washington Crossing, PA - At its annual meeting of the general membership, the Upper Makefield Vol. Fire Company elected their line officers for 2019. Elected at the meeting were (from right to left): Chief Tim Brewer, Deputy Chief Randy Berger, Battalion Chief Chip Coff, Battalion Chief Dave Wise, Captain Justin Brewer, Lieutenant Tyler Hub, Lieutenant Justin Kloc, and Safety Officer Kevin Campbell. Founded in 1967, the Upper Makefield Fire Company is celebrating 52 years of service to the township and neighboring communities with professional grade fire, marine and auto rescue, fire prevention and emergency services. The Hershey Fire Department formerly operated this 1980 Henderickson/Pierce 85' Snorkel as Snorkel 48. The apparatus was sold to Lykens Fire Department in the early 90's. The Middletown Volunteer Fire Department is located at 10 Adelia Street in Middletown, Pennsylvania. Truck 88 is a 2009 Seagrave Marauder II, 95’ Aerialscope. Features include 178’ of ground ladders and single stang gun in the bucket. Engine 88 is a 2001 KME Renegade Pumper. Features include a 2000-GPM pump, 500-gallons of water and 20-gallons of Class A foam. Rescue 88 is a 2006 KME Renegade Rescue/Pumper. Features include a 2000-GPM pump, 500-gallons of water, 20-gallons of Class B foam, 2 Amkus electric dual simo pumps, a portable gas powered Amkus dual simo pump, 2 Spreaders, 1 O-cutter, 1 Panel cutter, 1 16’’ ram, and 1 20’’ ram. On the evening of February 4th, members of Cumru Fire participated in a drill to simulate the difficult removal of a downed firefighter. The drill was also designed to work with Scott and Drager SCBA, as the department will be purchasing breathing apparatus in the future. Pictured is Deputy Chief Brad Silcox working through a collapsed ceiling scenario. The prop was quickly put together with OSB, scrap 2x4's, wire, and a pickup truck net. Rental Truck Versus Railroad Bridge in Upper Hanover Twp. Upper Hanover Twp., PA - On Sunday, January 27th at 2:05 P.M., East Greenville Fire Co. was dispatched to an incident involving a rental truck and a railroad bridge on Shuler Rd., in the township. Upon arrival, they had a rental truck that received some damage after it hit the railroad bridge. Apparently, it was the driver's error, as he did not see the caution signs. He sustained minor face and head injuries. Assisting the fire company were Fire Police from East Greenville and Hereford. Upper Perk EMS and PA State Police were also on scene. Blaze Destroys Peters Twp. Garage This Ford serves as an incident support vehicle for the Lehigh County EMA. JUMP TO FILE #022019100 was filled with hay and animals. Once the fire was under control, command was able to begin releasing some of the units around 1:33 P.M. Command was then transferred over to Mercersburg’s Deputy Chief Jeff Main to oversee overhaul operations. Firefighters remained on the scene for an additional hour dowsing hot spots to ensure that the fire was out. The cause of the blaze is not currently known, and no injuries were reported. All units were able to clear the scene shortly after 2:30 P.M. that afternoon. Mercersburg’s MMP&W Vol. Fire Company responded on the call with assistance from St. Thomas Fire Co.18, Franklin Fire Co. Station 4, Chambersburg Fire Co.1, Marion Fire Co.8, Metal Twp. Fire & Ambulance Co.21, Greencastle Rescue Hose Co.3, Fannett-Metal Fire & Ambulance Co.12, Fulton County crews from McConnellsburg V.F.C. Co.56 and Hustontown V.F.C. Co.57. Additional assistance was received in the way of transfers from New Franklin Fire Co.17, Mont Alto Fire Co.5, Huntingdon County’s Shade Gap Area Fire Co.14, Cumberland County’s Cumberland Valley Fire Co.53 and Vigilant Hose Co.52, who covered the area while crews were committed on the scene. City of Pittsburgh Fire Chief Darryl Jones briefs local media after a fatal fire on 2/6/19. Nanticoke Fire Chief Kevin Hazleton takes up from an RIT response at a two-alarm house fire. Port Carbon Fire Marshal Scott Krater on the scene of a multi-alarm fire in the borough. Etna Station 149 Chief Greg Porter confers with Peebles Firefighter Wadas at the scene of a structure fire in McCandless. Hazle Township Firefighter Leon Motel comes out of Boscov's Department store during a two-alarm fire. about these three qualities. Proverbs 17:7 (GN) “Respected people do not tell lies.” True leadership is built on one thing - trust. It’s difficult to follow somebody you don’t trust. And all trust is built on truth. So, if you don’t tell the truth nobody trusts you, and if nobody trusts you, nobody’s going to want to follow you (home, marriage, work, church… ). Why is it that when we look around in our society many of our leaders are held in low esteem? Because they don’t tell the truth, because they don’t keep their word, because they don’t practice what they say they believe. In other words, they lack integrity. Proverbs 25:14 (GN) “People who promise things that they never give are like clouds in a wind with no rain.” If you want to be a person of lasting legacy, you’ve got to keep your word (even little things). Studies have shown that the number one cause of resentment in children is parents who don’t keep their promises. Is it easy to live with integrity? No. That’s why you need God’s help. You need to make as your prayer this next verse. Psalm 101:2 (LB) “I will try to walk a blameless path but how I need Your help especially in my own home where I long to act as I should.” A good definition of success (relationally speaking) is having those who know me best, respect me most. To me that’s success. It’s easy to impress people from a distance. But real integrity is when those who know you best respect you the most. Turtle Creek rookie Firefighter Chelsea Cook and Timothy Marbella at the scene of Chelsea's first-ever fire in Pitcairn on January 6th. Congrats Chelsea! Crews battled fire in 3 homes in McKees Rocks on 2/20/19. JUMP TO FILE #022119102 quested. Fire units quickly arrived and began to go to work, both from the front and rear of the home. A second home quickly began to catch fire and a third-alarm was requested. Due to the closeness of the homes and how fast the fire was spreading, a fourth-alarm was requested with an additional engine about 15 minutes into the incident. IN SERVICE If you have photos you would like to see in our In Service feature, please upload them on our website www.1stResponderNews.com or email them to Lindsey@1stResponderNews.com. The New Kingstown Fire Company operates this 2016 Pierce Enforcer (1500/650/4 Tool Amkus Ultimate System) as Squad 33. Shillington Borough, PA - An unusual bank transaction occurred at the M&T Bank in Shillington Borough when an SUV caught fire at the drive-thru window on January 16th. Dispatchers at Berks County Department of Emergency Services received phone calls around 3:30 P.M. and began sending companies to 1 West Lancaster Avenue. With the fire underneath the roof structure, the assignment was upgraded to a structural response. Engine 42-1 arrived and placed a hose line into operation. The fire was knocked down quickly without any extension into the bank. No injuries were reported. Chambersburg, PA - On the afternoon of January 30th, Chambersburg Fire Department was alerted with several surrounding departments for an apartment building fire at 911 Byers Avenue in the Boro of Chambersburg on Box 1- JUMP TO FILE# 02. Franklin County 020219102 911 took the call just after 1:30 P.M. after a smoke detector alerted one of the residents and they discovered the fire. Chambersburg Chief Dustin Ulrich marked up directly after dispatch and was advised that they had reports of a possibility of entrapment since all occupants were not accounted for at the time of dispatch. Chambersburg Engine 1-4 was the first to arrive, reporting fire showing from side 'Charlie' of the structure. Chief Ulrich arrived and reported a three-story garden style apartment building. Engine 1-4 dropped a supply line and set up for fire attack as Chief Ulrich conducted a complete 360 of the building to assess the situation. Ulrich reported heavy fire conditions on all three divisions and immediately requested the second-alarm assignment. Firefighters made entry to attempt an offensive attack and search for victims, but were met with deteriorating conditions. Firefighters were only inside for a few minutes before Command made the decision to have the Evac Tone sounded, pulling all personnel from the structure. The structural integrity was weakened, forcing firefighters to switch to a defensive attack. Firefighters were able to knock down a bulk of the flames within 20 minutes of their arrival on the scene. Firefighters continued to work to control the blaze as minimal interior crews made entry to search the building for victims, which came up negative. It was later confirmed that all occupants were able to safely evacuate the structure. Crews battled the blaze for over one hour before command reported the fire under control around 2:43 P.M. Firefighters remained committed conducting extensive overhaul operations to ensure that the fire was completely out before clearing the scene. All emergency crews were clear of the scene around 5:15 P.M. that evening. The afternoon blaze displaced 13 occupants from six apartments. The American Red Cross Greater Pennsylvania Region was called in to assist the families affected. The cause of the blaze and the point of origin is not currently known, but the rapid spread of the fire was contributed from the high winds that fueled the flames. Chief Dustin Ulrich of Chambersburg FD requested a secondalarm as crews arrived to find heavy fire conditions at 911 Byers Ave. on 1/30/19. Allentown firefighters arrived to find a well-off garage fire at 739 Tilghman St. on 1/2/19. a second attack line. Engine 14 was ordered to come in from a nearby alley and assist with fire suppression and gaining access through the garage door. Crews made a quick hit and were able to have the fire knocked down within 15 minutes. They remained on scene for a few hours mopping up and assisting the fire marshal. The apartment house on the property is still marked unfit for habitation following a Spring 2018 fire that gutted the thirdfloor. - DENNIS WETHERHOLD, JR.
Sunbury Steam Engine Co.1 runs this 1986 Ford/Allegheny 500/300 Mini Pumper as E-522. The East Petersburg Fire Co. recently placed two new units into service, including a 2018 Ford F350 Super Duty Extended Cab with 9-ft. enclosed Knapheide body, and a 2018 Ford F350 Super Duty Crew Cab with 9-ft. Knapheide body. Pittsburgh Crews Find One Person Trapped on Arrival, Make Quick Grab City of Pittsburgh, PA - At 10:56 A.M. on January 12th, City of Pittsburgh firefighters were dispatched to Fire Zone 3-6 for a reported porch on fire located along the 3900 block of Liberty Avenue in the city’s Lawrenceville section. First arriving units found a working fire with heavy smoke showing from the rear of the structure. A second-alarm was quickly struck at 11:03 A.M. after the commanding officer received a report of somebody being trapped on the third-floor. Crews in the rear of the structure found heavy fire and heard someone yelling for help. The victim tried to escape on their own but retreated back into the home due to the intensity of the flames. Crews bring a victim down the steps after knocking down the bulk of the ﬁre. The fire originated in the kitchen on the 'B/C' corner and quickly spread. Firefighters arrived to find heavy smoke and flames coming from a house on Kauffman Road West on 2/2/19. Firefighters climb onto Squrt 64-20 to head to the roof for vertical ventilation. The vehicle went airborne before striking the side of the tattoo parlor.
! T I S S I M DON’T Allentown Spring Melt Fire Memorabilia Marketplace 0 $1 Contribution for Admission Free Parking! Sunday, April 14th Opens at 9 A.M.
Fire Service Antiques, Collectibles, Apparatus, Equipment and much more.. Smoke and flames exit the buildings as the ladder pipe works from the 'B/C' corner. two lines into the neighboring home. Once everyone was accounted for, the ladder pipe off 183 Truck was put into service. Freeland backed their ladder down Green Street to the 'A/D' corner and put their pipe in service. Multiple hand lines were opened up from the street onto the building as well. The bulk of the fire was knocked down around 10:00 P.M. At that point, most of the roof of the building had collapsed into the attic. Crews remained on scene well into the evening mopping up the blaze that destroyed the original duplex. West Hazleton firefighters were called back to the scene around 4:40 A.M. after reports were received of fire in the roof. Crews found active fire when they arrived. It is believe that the entrapment reports turned out to be false, however there is no official word at this point. Some reports also indicated that a firefighter was transported to a hospital for minor injuries. Saint Clair Fire Chief Frank Uhrin operates Tower 62-21 at a threealarm fire in Port Carbon. Allentown FF Dennis Walton changes out the air cylinder of FF Chad Ege during a working garage fire at 739 Tilghman Street on 1/2/19. More than 25 vehicles, including dump trucks and tractor-trailers, were involved in the Route 222 pile-up. JUMP TO FILE #011719102 was not working, so crews had to find a different hydrant to establish a water supply. While crews were searching the home, other crews began to attack the fire. All searches came up negative. Firefighters had a hard time inside the home due to hoarding conditions. The reported trapped individual was eventually found to be unharmed and not inside the home. Units from the South Lebanon Twp. Fire Department were alerted to a reported chimney fire in the 400 block of South 5th Ave. on February 3rd. Wagon 48 pulled up just past the house and got ready to go offensive if needed. Like clock work, the department checked the house and cleared the scene in under 25 minutes.